A substitution mutation is a type of replication error during DNA replication which places the wrong nucleotide or sequence of nucleotides in the wrong position. A type of substitution mutation, a point mutation, occurs which a single nucleotide is substituted. This can be seen in the image below. 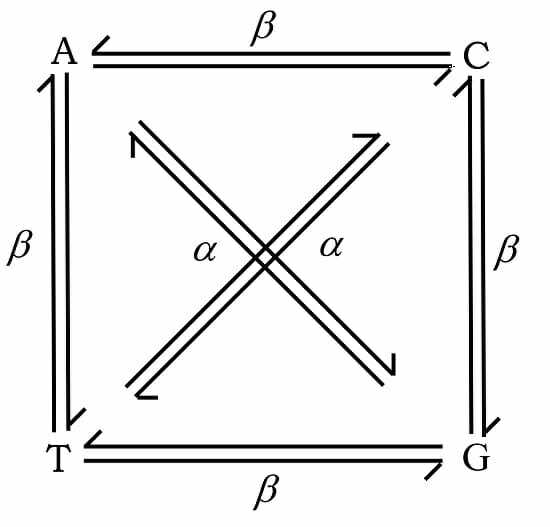 Importantly, a substitution mutation results in DNA of the same length. It does not add or subtract from the number of nucleotides in the sequence. A single nucleotide substitution mutation is the most common, as most large-scale nucleotide swaps involve other mechanisms. For example, a reciprocal translocation involves the movement of entire portions of chromosomes, and swaps one portion for a portion of another chromosome. As with all mutations, a substitution mutation can drastically change the proteins created by an organism. The proteins responsible for reading DNA process the molecule in units of three base pairs at a time. These codons each specify a different amino acid. If the sequence change even by one nucleotide, a different amino acid is placed within the protein. The function of each protein is dependent on the specific interaction between the amino acids they consist of. A substitution mutation can displace many more than one nucleotide. In this case, it may make the protein completely dysfunctional, or give it an entirely new function. New adaptations can arise this way, if they are transferred to the offspring and are beneficial. However, the large majority of mutations are deleterious, or cause negative effects. What causes a Substitution Mutation? 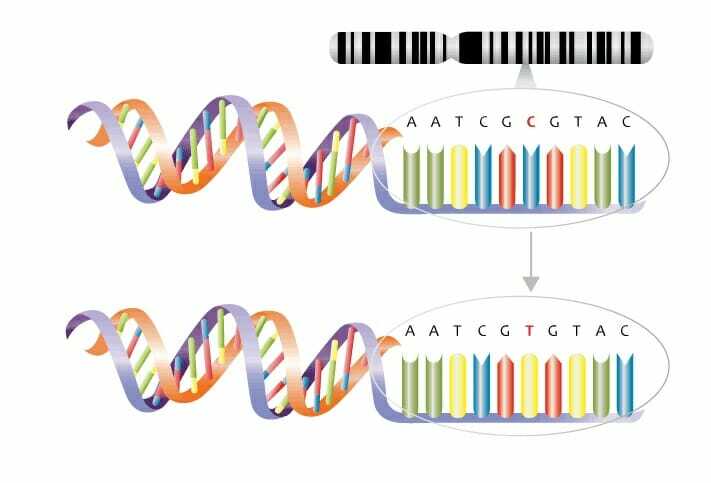 A substitution mutation can be caused by a number of sources directly related to the reading and storage of DNA. For instance, every hour each cell in your body losses around 1,000 nucleotides from the DNA backbone. These nucleotides fall off due to the process of depurination. In the process of replacing them, the proteins that manage the DNA make a mistake approximately 75% of the time, because there are 4 nucleotides to choose from. Other proteins must come along after and check the DNA for errors. If they miss the substitution mutation, it may stay and be replicated. Another factor which can drive a substitution mutation is deamination, the process by which amino groups degrade off of nucleotides. One of the only ways the protein machinery can differentiate between nucleotides is the amino groups attached to them. As these fall off, the protein machinery can misrecognize the nucleotide, and supply the wrong nucleotide pair. When the DNA replicates, the new nucleotide will become established in a new cell line. On top of these internal drivers which can cause a substitution mutation, there are also external forces which can cause nucleotide swaps. Carcinogens and mutagens are a special classes of chemicals which drastically impede the protein machinery and cause lots of mutations. Even sunlight can degrade and impede with DNA function, driving a substitution mutation. The blood disease Sickle-cell anemia is caused by a simple substitution mutation. In the mutation, a single nucleotide is replaced in the portion of DNA which codes for a unit of hemoglobin. Hemoglobin is a multi-protein complex, responsible for carrying oxygen and supporting the shape of blood cells. The substitution mutation causes a glutamic acid in the protein to be changed to a valine amino acid. While this might not seem like much of a change in a protein which contain over 140 amino acids, it makes all the difference. Valine, unlike glutamic acid, is hydrophobic. As such, it repels polar interactions where glutamic acid would attract them. This severely impacts the protein’s ability to function. Blood cells immediately reflect this change, becoming shriveled and sickle-shaped. With a lower ability to carry oxygen, these cells also are more prone to clot within the small capillaries of organs. This can lead to an increased risk of heart attack, stroke, and other cardiovascular diseases. Interestingly, the substitution mutation has survived in the population for a surprising reason. The parasite which causes malaria depends on human blood cells for part of its life cycle. People with the sickle-cell substitution mutation are less susceptible to getting malaria. Apparently the different shape and function of the blood cells impedes their reproductive processes. In your eye, certain cells are responsible for picking up the colors red, green, and blue. These cells rely on different proteins, which react to the various colors. A substitution mutation in the DNA that codes for one of these proteins can lead to the condition of color blindness. People with this condition have a hard time distinguishing between the colors, while their vision is still clear otherwise. Oftentimes, only one color is knocked out. The various proteins are coded for on different places on the DNA, which makes a substitution unlikely to occur in all three genes. There are two basic types which a substitution mutation can be. Within the four nucleotides, there are two types: the purines and pyrimidines. Adenine (A) and guanine (G) are both purines, while cytosine (C) and thymine (T) are pyrimidines. If a purine changes to a purine, the substitution mutation is considered a transition. Likewise, if a pyrimidine changes into a pyrimidine, the substitution mutation is also a transition. In the image below, transitions are labeled by the alpha lines. The opposite of transition is transversion. In a substitution mutation involving a transversion, a purine is substituted for a pyrimidine, or vis versa. In the above image, a transversion is labeled by the beta lines. Transversions are much less likely than transitions. This is probably due to the fact that the machinery used to repair and proof-read the DNA are more specific for purine versus pyrimidine than specifying between individual nucleotides. 1. What is the difference between a substitution mutation and a deletion mutation? B is correct. A substitution mutation may cause a difference in the protein, but a mutation can completely change the entire code. A frame-shift mutation happens whenever an insertion or deletion into the DNA causes the 3-codon frame to shift, which calls for entirely different amino acids. Which of the following happened? C is correct. If a deletion or insertion had happened, the code would be a different length. A substitution occurred on the second nucleotide from the left, changing a T to a C. This would be considered a transition substitution mutation. 3. A substitution mutation occurred in an organism. It happened to change the sequence of amino acids just slightly, and the new amino acid is only slightly different than the old one. Will the mutation result in a functional change? C is correct. There are a lot of factors which affect the function of a protein. Even a single change in amino acid can drastically change the function. However, if the amino acid changed is very similar to the first one, it may not change the overall function.